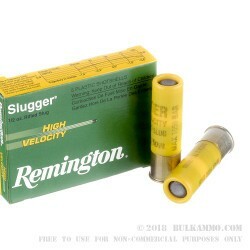 These Remington high velocity slugs give your 20 gauge some serious reach that buckshot just can't match. 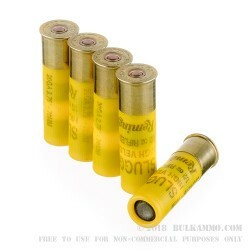 Each 2-3/4" shell in this box of five fires a 1/2 oz (218.75 grain) projectile at a muzzle velocity of 1,800 feet per second, maintaining good accuracy out to 100 yards or beyond for reliable kills against deer and other game. Each shot produces a muzzle energy of 1,575 foot-pounds. 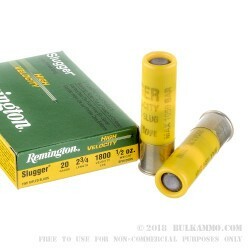 Remington is one of only a few companies in the world that manufactures both shotguns and shotgun shells. Their ammunition production is based in Lonoke, Arkansas. Q: I have never shot a slug round before. So this is my question, can you shot them with a choke barrel ? A: It is safe to shoot a slug though a barrel that is fitted to have chokes attached. You will want to make sure a choke is attached to the barrel if you are wanting to protect the threads that accept chokes on the end. 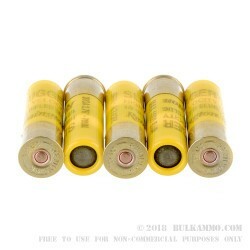 More restrictive chokes, such as a full choke, may reduce the accuracy and effectiveness of the slug you are shooting. A modified or improved choke would be a better fit. Q: Are rifled slugs meant to be shot from smooth barrels? A: Yes the slugs have rifling cut into the slug to attain superior performance out of a smooth bore barrel.